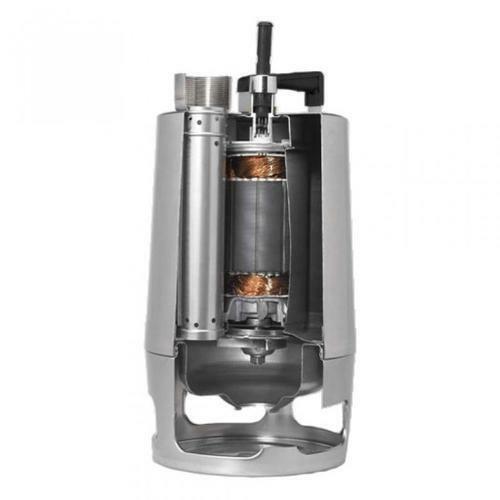 Submersible drainage pump Vertical single-stage stainless steel submersible pump with vertical discharge port and integrated submersible totally enclosed motor. The pump is fitted with a suction strainer. Fitted with a SEMI OPEN impeller with a 12 mm free passage suitable for pumping groundwater, surface water, rain water and similar. The pump is fitted with a double shaft seal and an intermediate oil chamber pre-filled with non-toxic special oil. A cooling jacket allows for continuous cooling of the motor by the pumped liquid. The pump is ready for use as it is fitted with carrying handle and is supplied with a 10 m mains cable. The materials of the pump ensure excellent corrosionresistance. The pump housing and impeller are made of highquality stainless steel. Furthermore, the mechanical shaft sealoffers high-wear resistance and a long operating life. The single-phase version is effectively protected against anyaccidental overload by built-in thermal protection.This means that no additional motor protection is required. The pumps are available with float switches for automatic on/off operation. Established in the year 2011 at Rajkot (Gujarat, India), we “Shri Uma Sales & Service” are engaged in trading an excellent quality range of Panel Meter, Electric Dioxide Generator, Swimming Pool Vacuum Heads, Pressure Booster Pump, etc. We are a Partnership firm and we source products from the reliable market vendors which can be availed from us at reasonable prices. Under the guidance of our mentor “Mr. Kamlesh Patel”, who holds profound knowledge and experience in this domain, we have been able to aptly satisfy our clients. We are also providing Installation and Repairing Services or all our Products.